We’re proud to offer commercial roof installation services in Midland that will exceed your expectations. The roof on a commercial building is different from the type of roof you’d find on a home or apartment building. Commercial structures tend to use more heavy-duty materials that can last longer and withstand harsh climate conditions. Additionally, a commercial building is generally much larger than a residential structure, so the roof is quite a bit larger. When you’re looking for a company in the Midland, Ontario area that can provide commercial roof installation, it’s important to choose a partner that understands these differences and can handle the job. At Slippery Slope Roofing, we’re proud to offer commercial roof installation services that will exceed your expectations. We can perform the installation job as part of a construction project on a new building or provide a replacement roof if yours is reaching the end of its lifespan. When we install a new roof for a commercial client, we use high-quality materials designed to last for many years. 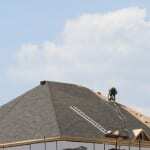 We provide the best possible service and work efficiently until your new roof is complete. The process of proper commercial roof installation starts with the placement of a layer of waterproofing material. When this step is skipped, it’s much more likely that you’ll experience leaks anytime it rains or snows. The next step is placing the shingles, which will create a visually appealing look while offering the protection you expect for your building. Each of our trained and skilled roofing professionals understands the complexities of commercial roof installation and is up to the task, so contact us today for an estimate. At Slippery Slope Roofing, we offer high-quality commercial roof installation services in Midland, Orillia, Barrie, Bradford, Alliston, Newmarket, Midhurst, Cookstown, Beeton, Innisfil, Angus, Collingwood, Wasaga Beach, Oro-Medonte, New Tecumseth, Clearview, Bradford, Essa, Stayner, Springwater, and surrounding areas of Ontario.